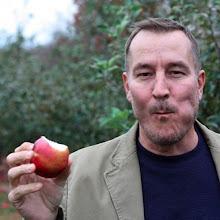 If you are like me and hosted Christmas dinner then I am going to assume you had leftovers. We served 12 people and I feel like we could have fed 28. So I had leftovers. I am doing as much as I can from Country Ham Salad, to Homemade Turkey Broth, to just straight up sandwiches in order to get the fridge back to its normal capacity. 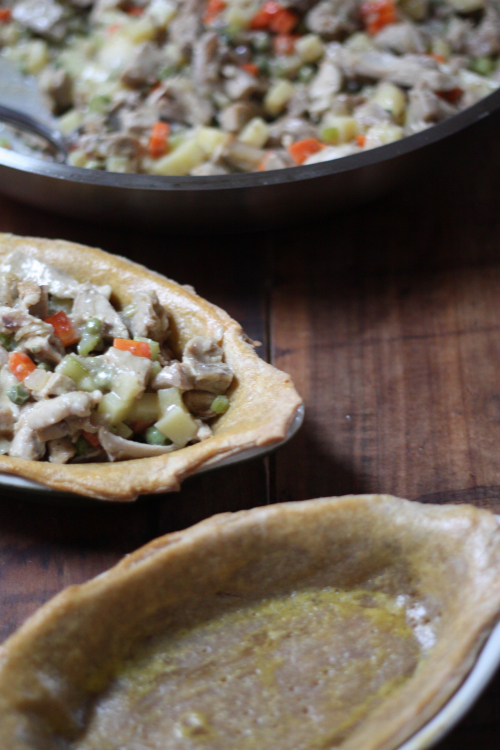 Well, with a little leftover turkey, here is a great way to get rid of a bunch of things all at once — Turkey Pot Pie! 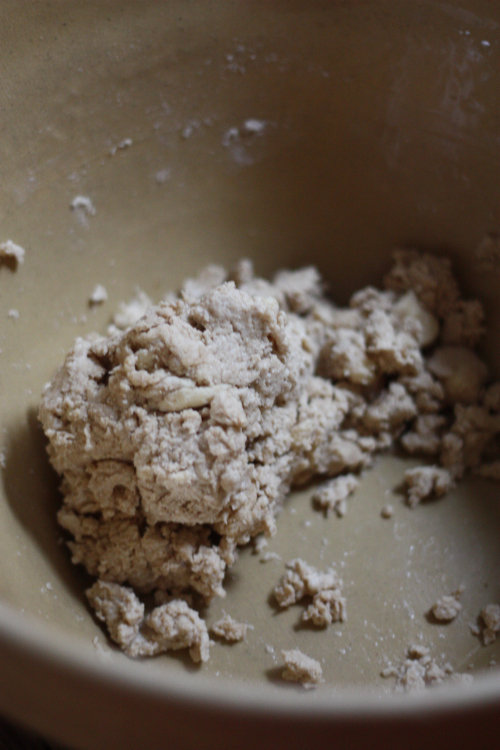 First we will make a basic pie crust dough. 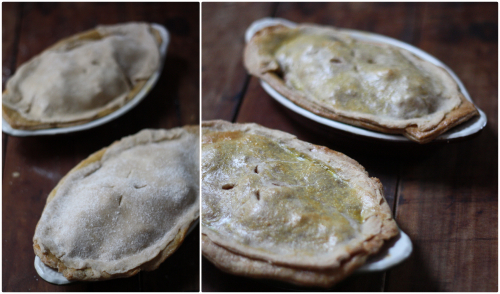 You can certainly skip this step and use a standard pie crust but I had some time on my hands so I pulled out the big guns. 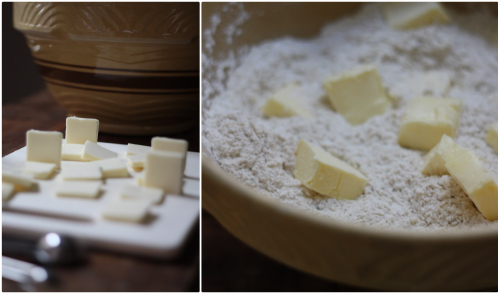 Mix the butter and flour, pinching the flour and the butter between your hands until mixed and somewhat crumbly. Add water, 1 to 2 tablespoons at a time, until you reach the above consistency. You may not use all of the water (I used 5 tablespoons in all). Spread the dough out on a floured work surface and work into two balls — place them in separate plastic wraps and put them in fridge. ** If you do not have gravy you will have to make a simple roux by melting 2 tablespoons of butter and adding 2 tablespoons of flour, whisking until it changes colors and darkens. Then whisk in broth to again remove any remaining lumps. 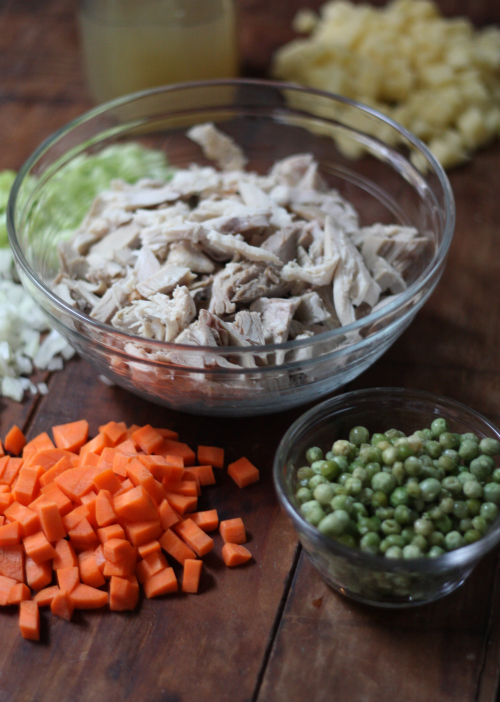 I told you we were going to use up some leftovers (feel free to toss in additional ingredients as you see fit — we're using up stuff here, people)! 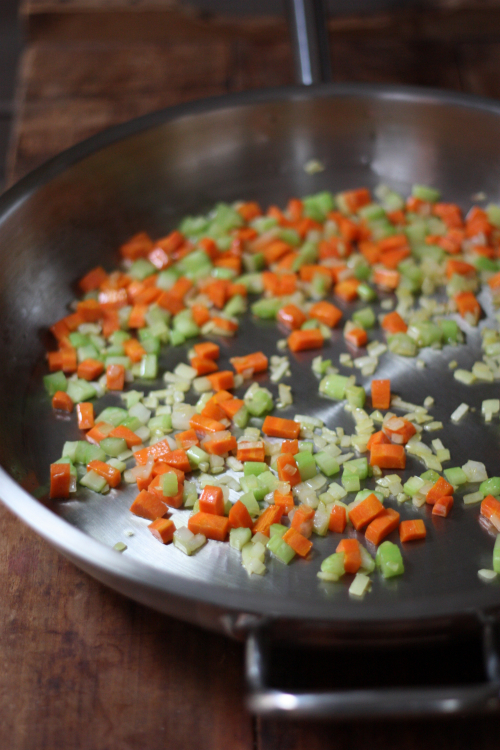 Heat olive oil in a pan and add the onion, celery, and carrot. 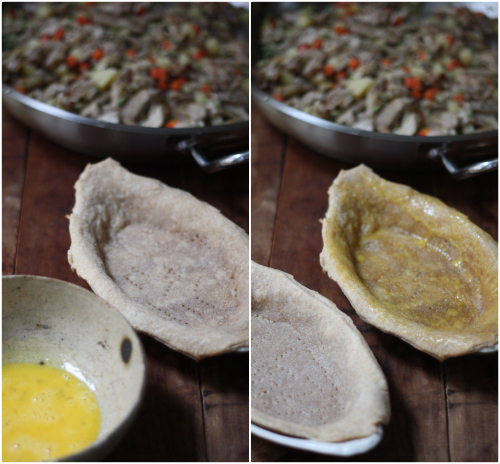 Cook until soft and and remove to a plate (not pictured). Add your gravy to the pan, heat and whisk in the turkey broth to get rid of any lumps and watch until the mixture turns into a dark broth. Add paprika and fresh thyme. Return cooked vegetables to the pan adding the potatoes, peas, turkey, and any optional mashed potatoes. 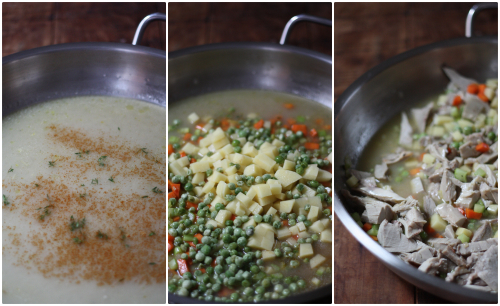 Mix to incorporate and heat for 20 minutes. Remove from the stove and cool. 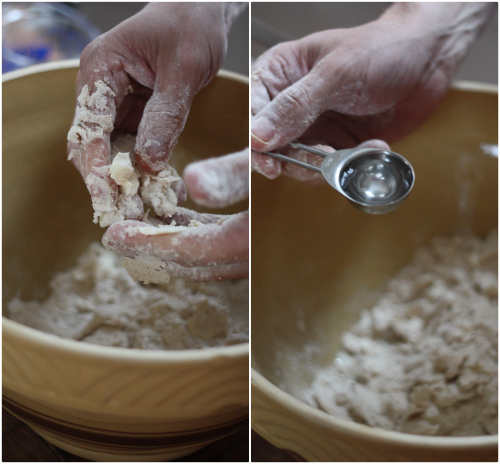 Remove one of the dough balls from the fridge and roll out onto a floured surface. 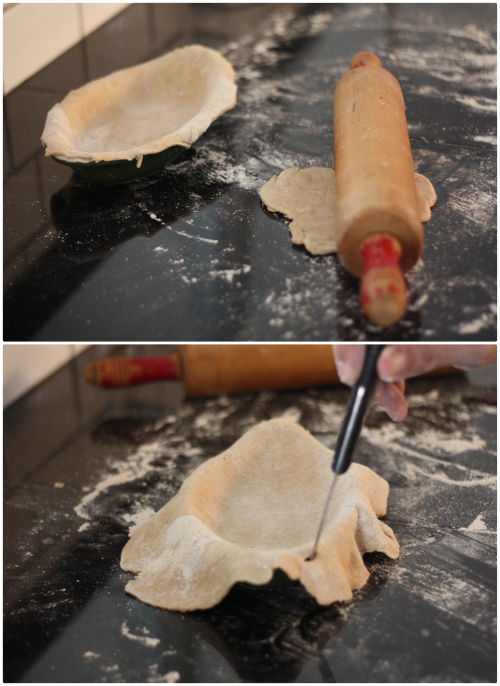 Once 1/4" thick, place over ramekins or individual pie tins, cutting to fit, reusing the cut dough to make additional crusts. Prick these with a fork all over and insert in a 375 degree oven for 15 minutes. After 15 minutes, remove from oven and glaze crusts with your egg wash. Return to the oven for 15 minutes or until brown. Remove and cool thoroughly. 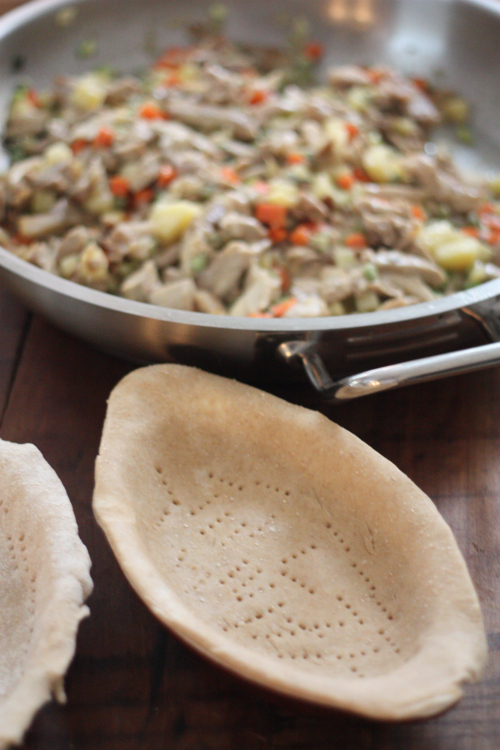 Once the crusts have cooled, spoon turkey/vegetable mixture into the crusts. 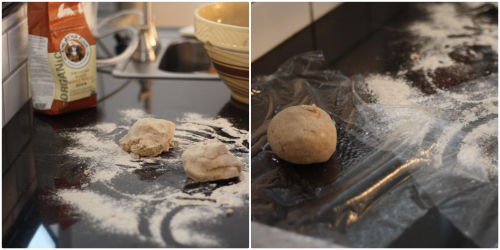 Remove the other dough ball from the fridge and roll out on a floured surface. Shape to fit the tops and pinch the sides down to seal. Brush egg wash on top and cut 4 knife holes in the top of each for steam to release while cooking. Return them to a 375 degree and bake for 20-25 minutes. 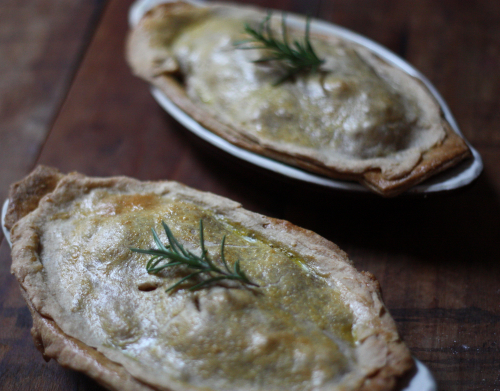 Remove from the oven, garnish with fresh herbs from your garden (I chose a rosemary sprig) and enjoy leftovers without feeling like you're having leftovers. 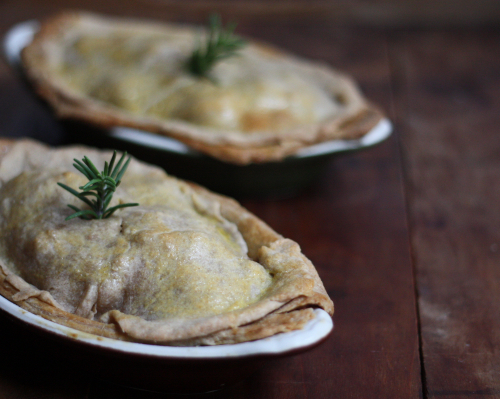 This might be a little time consuming if you are making your own crust but it is well worth the effort. What have you been doing with all of your leftovers this holiday? I have made a variation of this pot pie, except I used a large aluminum pan, and some frozen, or canned peas and carrots which worked out good.